Visiting 4 Countries: Honduras, Guatemala, Belize Mexico and the Maya Classic most important archaeological sites, including: Copan, Quirigua, Xunantunich, Yaxha, Caracol, Tikal, Bonampak, Yaxchilan, Piedras Negras, Sak-Tzi, Palenque and Tonina. SCHEDULE: Tour begins on the first and third Saturdays of each month all year around. Arrive to Guatemala City, Guatemala. Depart from Villahermosa Mexico, 11 days later on Tuesday. DAY 8 SAT. PIEDRAS NEGRAS, Guatemala & SAK TZI, Mexico. DAY 9 SUN. 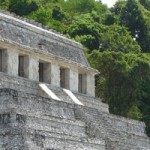 PALENQUE, Mexico. DAY 10 MON. TONINA, Mexico. DAY 11 TUE. Departure from Villahermosa, Mexico. Arrive on Wednesday before the beginning of the Maya Classic Tour to visit the Living Maya in the Guatemala Highlands, including Antigua, an UNESCO World Heritage Site Spanish Colonial jewel, the beautiful Lake Atitlan and Maya villages around it and the colorful Chichicastenango Market.